Joseph Sedona's New Book "The Magic Westinheimer Two- Musical Mayhem" is the Fast-Paced Magical Adventure of Laurel and Her Friends as They Pursue the Maniacal Mayhem. Newest publication "The Magic Westinheimer Two- Musical Mayhem" from Fulton Books author Joseph Sedona is the second in the Magic Westinheimer series. Laurel and her enchanted piano have accidentally unleashed a maniacal leprechaun named Mayhem, whom she must now stop with the help of her mystical friends. Dunedin, FL, February 13, 2018	(Newswire.com) - Joseph Sedona grew up in the Tampa Bay area where he studied and taught martial arts, starting at a very young age. He eventually opened a studio of his own with a focus on youth programs. He has been successful for over twenty years due to his belief that his students should be treated like family. Much of his writing is based on real life and inspired by his family. 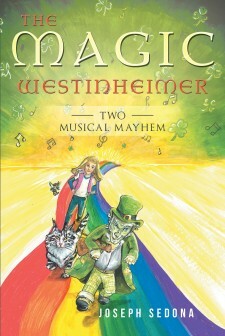 Joseph has completed his most recent book “The Magic Westinheimer Two- Musical Mayhem”: a fast-paced magical adventure that will take Laurel and her mystical friends around the world and through time in hot pursuit of the maniacal leprechaun Mayhem. Published by Fulton Books, Joseph Sedona’s book follows Laurel and her enchanted piano as they accidentally summon a maniacal leprechaun named Mayhem. He steals her songbook, which doubles as her road map to the magical realms, then goes on the ultimate crime spree that will take him from El Dorado to Ancient Egypt, from the distant past to the distant future. Luckily, all of Laurel's friends are willing to help her stop the leprechaun’s rampage. Tatanka, the time-shifting guardian cat who lives nine different lives simultaneously, is back. Daff, the work-a-holic fairy from the Black Forest, and Houdini, the rhyming ferret, are also along for the ride. The bumbling and clueless magician, Kurt Westinheimer, of course, lends a helping hand. Even with the aid of her friends, however, Laurel is still outmatched by the cunning and ruthless Mayhem who lives by no rules. To catch him, Laurel and her friends will need all the help and luck they can get. Readers who wish to experience this enthralling work can purchase “The Magic Westinheimer Two- Musical Mayhem” at bookstores everywhere, or online at the Apple iTunes store, Amazon, Google Play or Barnes and Noble.